Congratulations to Farid Yachou, Winner of WPT Amsterdam (€215,000)! After six epic days of poker in the capital of the Netherlands, it was poker-tournament debutant Farid Yachou, from the city of Leeuwarden, who came out on top. Yachou defeated a field of 341 entries to capture the first-ever WPT main tour title up for grabs in Holland. He took home €215,000, a WPT World Championship entry, and a pair of Monster DNA headphones. Steve Warburton started the day as chip leader with 2.8 million in chips, and American pro Jason Wheeler came into the day as the short stack with one million. On the 10th hand of play, it was Wheeler who hit the rail, as he made two pair against Yachou's flopped set. The money went in on the turn, and Wheeler collected €41,260 for his efforts. This will be a nice addition to the €125,000 he scored for winning the €6,000 High Roller here in Amsterdam just a couple days prior. The next big clash took place during Hand #32, when Joep van den Bijgaart got three-bet by Warburton to 200,000. Van den Bijgaart shoved for 1.45 million, and Warburton tank-called holding ace-queen. Van den Bijgaart's pair of tens remained in the lead through the turn, but the river crushed his dreams when a queen peeled off. Filled with emotion, Van den Bijgaart threw his hands in front of his eyes, and exited the tournament room in disbelief. The Dutch top pro collected €51,000 for his fifth-place finish. In fourth place, the tournament lost Fredrik Andersson from Sweden, who couldn't get anything going all day. On his final hand, Andersson got his money in very well with ace-king against Kees van Brugge's king-ten of hearts, but the river gave the Dutchman a straight. 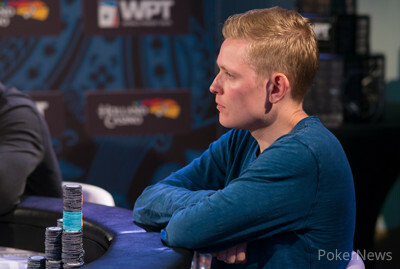 Andersson cashed for €68,000 and a tough three-handed battle commenced. 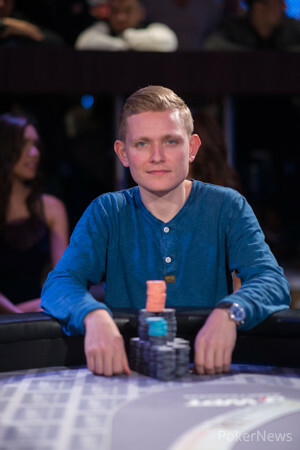 After 75 hands of back-and-forth play, it was van Brugge who busted out in third place for €90,000. He was the most active player three-handed, but he couldn't overcome Warburton and Yachou. On van Brugge's final hand, he got his chips in with ace-eight and lost to Warburton's ace-queen. Warburton started the heads-up battle with 5.4 million versus Yachou's 4.8 million, and for 87 hands they went toe to toe. Both players held the chip lead for extended periods, but just as Warburton was chipping up the most important hand of the tournament went down. Yachou made a set against Warburton's two pair, and the underdog became the favorite. Yachou grabbed a 4-1 chip lead at this point, and two hands later the tournament was done. On Hand #162 Warburton shoved all in for two million, and Yachou snapped it off holding a pair of sixes. The Brit tabled ace-eight, but the board was not kind to him as it brought nothing but blanks. Warburton, who seemed in shock as he left the set, won €150,000 for his second-place finish. Yachou celebrated with the rail, and he is the latest inductee into the WPT Champions Club. With that, PokerNews' coverage from WPT Amsterdam is done, but we've got plenty of live reporting running for you to stay busy with. Check it out, and we'll see you at the next stop! And The Winner is.... Farid Yachou! Donnie Peters and Chad Holloway are back from Europe, and they discuss the World Series of Poker conference call, Chad's new poker-themed zombie comic, and more. Then, Frank op de Woerd talks with Sorel Mizzi about his SCOOP win, WPT Amsterdam, his swimming prop bet, and more. Hand #162: On the final hand of the tournament Farid Yachou limped the button and Steve Warburton moved all in from the big blind for 2,000,000 total. Yachou called right away and the showdown went as following. The board ran out and Warburton was knocked out! 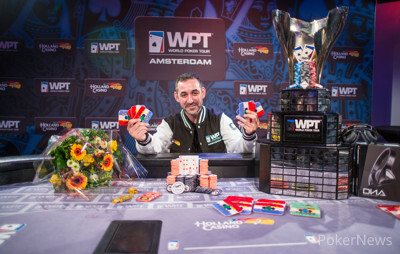 Yachou raised his arms aloft victoriously and celebrated winning the first ever World Poker Tour event in Amsterdam! Hand #158: Farid Yachou opens to 260,000 on the button, and Steve Warburton makes the call. The action checks to the turn on , and Warrington check-calls a 330,000 Yachou bet. Both players check the on the river, and Warburton takes the hand with for two pair. Hand #159: Steve Warburton limps the button, and Farid Yachou checks his option.The action checks through to the river on and Warburton takes it with a 160,000 bet. Hand #160: Farid Yachou opens the button for 260,000, and Steve Warburton calls. Warburton checks, Yachou bets 330,000, and Warburton calls. Warburton checks, Yachou bets 330,000, Warburton moves all-in, and it takes less than a minute for Yachou to make the call. Warburton tables , for two pair. “You have two-outs,” says Yachou as he shows for the flopped set. The dealer puts the onto the river and Yachou scores a huge double up. The dealer counts the stacks and Warburton is left with 2,550,000 chips. Hand #161: Steve Warburton limps the button, and Farid Yachou checks. The flop is , Yachou bets 225,000, and Warburton calls. The is checked through on the turn. The river is the and Yachou takes it with a 325,000 bet. Hand #148: Farid Yachou raised to 275,000 and he won the pot. Hand #149: Warburton limped from the button and Yachou checked. The hand was checked down on and Warburton bet 120,000 on the river. Yachou called and lost to . Hand #150: Yachou limped, Warburton checked. The flop came down and Warburton check-folded to a bet of 125,000. Hand #151: Warburton raised to 255,000 from the button and he won the pot. Hand #152: Yachou raised to 280,000 and he won the pot. Hand #153: Warburton limped and Yachou checked. The flop brought out and both players checked. The turn was the and Yachou check-folded to a bet of 325,000. Hand #154: Warburton received a walk. Hand #155: Warburton raised to 250,000 and Yachou called in the big blind. The flop brought out and Yachou check-called 240,000. On the turn the hit and both players checked. The river was the and both players checked again. Yachou showed and Warburton showed to take down this pot. Hand #156: Yachou raised to 250,000 and he won the pot. Hand #157: Yachou received a walk. Hand #137: Steve Warburton limps the button, and Farid Yachou checks. The flop is , and Warburton takes the pot with a 125,000 bet. Hand #138: Steve Warburton gets a walk. Hand #139: Steve Warburton opens to 250,000 on the button, Farid Yachou three-bets to 550,000, and Warburton folds. Hand #140: Steve Warburton gets a walk. Hand #141: Steve Warburton limps the button, Farid Yachou makes it 250,000, and Warburton calls. The flop is , and Yachou wins the pot with a 275,000 bet. Hand #142: Farid Yachou raises to 225,000 on the button, and Steve Warburton calls. The action checks to the river on , and Yachou wins the pot with a 200,000 bet. Hand #143: Steve Warburton raises to 225,000 on the button, and Farid Yachou folds. 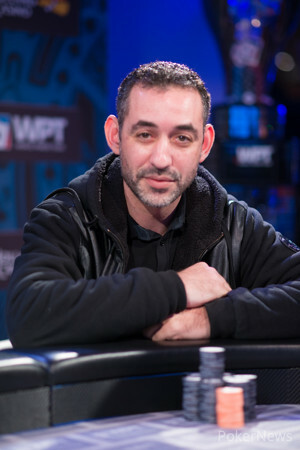 Hand #144: Farid Yachou opens to 225,000 on the button, and Steve Warburton folds. Yachou shows pocket nines. Warburton asks him if he would go all-in with pocket nines. “No…well…it depends on how you are moving.” Said Yachou. Hand #145: Steve Warburton limps the button, and Farid Yachou checks. The flop is and a 100,000 Yachou bets takes it. Hand #146: Farid Yachou limps, Steve Warburton checks. The action checks through to showdown on , and Warburton picks up the pot with , for a pair of fives. Hand #147: Steve Warburton limps the button, Farid Yachou raises to 250,000, and Warburton calls. The flop is , and Yachou wins the pot with a 275,000 bet. Hand #130: Farid Yachou limped from the button and Steve Warburton raised to 350,000 and Yachou folded. Hand #131: Steve Warburton raised from the button to 250,000 and took down the pot. Hand #132: Yachou limped from the button and Warburton checked. The flop brought out and Warburton check-folded to a bet of 100,000. Hand #133: Warburton limped on the button and Yachou checked. The flop brought out and Yachou check-called 120,000. On the turn the hit and both players checked. The river was the and Yachou check-called 330,000. Warburton announced he had a ten and showed . Yachou mucked. Hand #134: Yachou raised to 225,000 and Warburton called. The flop came down and Warburton check-called 250,000. On the turn the hit and both players checked. The river was the and Warburton lead out for 425,000. Yachou called and mucked, as Warburton showed . Hand #135: Yachou received a walk. Hand #136: Yachou raised to 225,000 and Warburton called from the big blind. The flop came down and both players checked. The turn was the and Warburton check-folded to a bet of 300,000. Six Hopefuls Will Battle it Out For the WPT Amsterdam Crown Today! WPT National Returns to Valkenburg in October!